1. Line a 1.5-litre loaf tin with two sheets of clingfilm, making sure that you have enough hanging over the sides to bring over the top and enclose the filling. 2. Place the cherries in a saucepan with a dash of water and simmer, uncovered, for 20 minutes. Strain the juice through a sieve, pushing down on the wire mesh to get as much as possible out of the fruit. You will end up with roughly 200ml cherry purée. If you want to add some of the surrendered fruit to the semifreddo, take out some of the cherries and set them aside for later (discarding the stones). 3. Next, place the eggs, almond extract and icing sugar in a bowl over a saucepan of boiling water. Whisk for 5 minutes, or until the eggs have quadrupled in size and the beaters can hold a ribbon trail. Take off the heat and whisk for another 5 minutes,until cool. 4. In another bowl, whisk the double cream then fold with the whipped eggs and the cherry purée until completely mixed together. Add the chocolate chips and reserved cherries (if using) and mix again. 5. Pour into the prepared loaf tin and wrap the overhanging clingfilm over the top. Freeze for at least 4 hours, or overnight. To serve, turn the semifreddo out of the tin, remove the clingfilm and cut into 2cm slices. Place each slice between 2 wafers, wrap a napkin around the sandwich and serve as a hand-held dessert. 6. 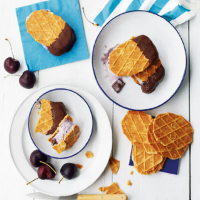 For a little extra indulgence, melt the 50g dark chocolate in a bowl over a pan of hot water and dip one end of the cherry semifreddo sandwich into it. Place in the freezer for 5 minutes to set before serving.